Crohn disease may present as elevation of the CRP and ESR, low iron, low serum albumin and low hemoglobin, positive ASCA and patchy inflamation is detected. The common symptoms and signs of Chron disease are arthritis, abdominal pain, bloody stools, diarrhea, anorexia, weight loss, aphthous ulcer, growth and puberty delay, uveitis, erythema nodosum and iron deficiency anemia. Surgical proceduure may be required if patient develop complications such as stricture, obstruction, perforation, bleeding and fistula. The treatment of Chron disease may include sulfasalazine ( aminosalicylates), corticosteroids,azathioprine ( immunomodulator ), infliximab, tacrolimus and cyclosporine. 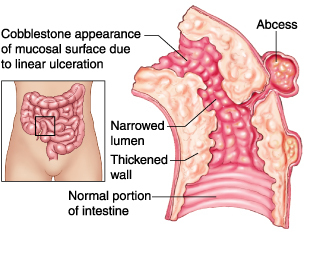 The differential diagnosis of Crohn disease are celiac disease, rheumatioid arthritis, lactose intolerance, infectious diarrhea and peptic ulcer disease.